Lab Notebook / Journal for judges to review during your judging session. Other items subject to the rules that will help explain your project to judges … photos, model, testing samples … be creative! A copy of your forms in case they are needed. All exhibits must be set up and approved by the WSSEF Display & Safety Committee at the Fair on the day and times shown below. 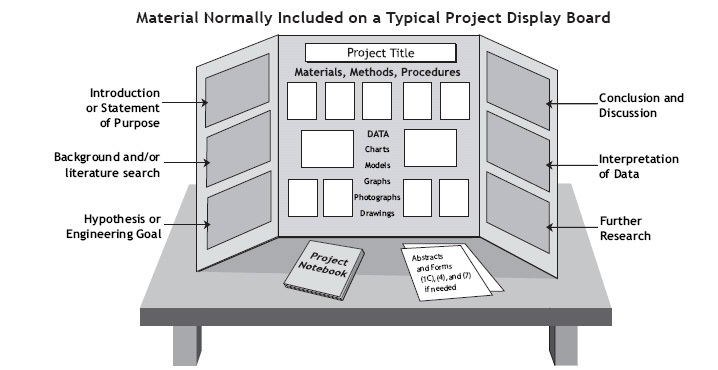 Project Example … See the example below, but implement your own creativity to make your display area reflect you and your project. Click Here for a full list of Intel ISEF Display and Safety Rules. WSSEF follows all Intel ISEF Display and Safety Rules. The entrant is required to furnish all materials needed to setup and show his or her exhibit (e.g., 9 foot long UL approved extension cord, tape, markers). The Display and Safety Committee reserves the right to remove any project for safety reasons or to protect the integrity of WSSEF and its rules and regulations. Ensure that photo and web credits are on the display. Exhibits exceeding the following will be disqualified at the WSSEF and ISEF. Tables are furnished (76 cm. high), but tall exhibits may be placed on the floor as desired. If a student feels it is important to show judges any of the not allowed items below, then students can take pictures, use laptop or devise other ways and display that portion of their project in their area. Human or animal food as part of the exhibitor demonstration of the project. Class 1 and Class 2 lasers are allowed to be used provided a finalist avoids indiscriminate exposure to other finalists, judges, or visitors (except if passed through magnifying optics such as microscopes and telescopes, in which case they may not be used). No other lasers may be used or displayed. Display and Safety Inspectors may revoke the privilege and require lasers to be removed if careless or indiscriminate use is observed. Serious offenses may result in disqualification. Project sounds, lights, odors, or any other display items must not be distracting. Exceptions to this rule may be permitted for judging demonstrations. Approval must be given prior to judging. All Grades 1 – 6 Exhibits must remain in place until 4:45 PM on Friday and be removed by 5:30 PM on Friday. All Grades 7 – 12 Exhibits must remain in place until 5:00 PM on Saturday and be removed by 6:00 PM on Saturday. Abandoned exhibits will be destroyed!